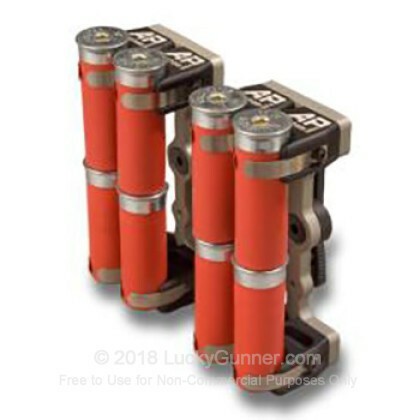 The QL Series of Shotshell Carriers are the ultimate high-speed accessory for those interested in multi-shell shotgun loading! Four-round shell loading is an advanced, highly efficient method of speed-loading a modern shotgun. By grasping and loading four shells per throw, you can dramatically decrease your reload times, with a little practice. The QL/8 Shell Carrier holds 8 shells tightly in place until you're ready for them. The adjustable angle Blade-Tech Tek-Lok backer allows for quick and easy mounting in whatever configuration best suits your shooting style. AP Custom makes some of the most sought after Shotshell Carriers on the market today. By focusing on the specific needs of competitive 3-Gun shooters, AP Custom has developed a line of shotshell carriers that maximize reloading speed and efficiency! Machined from a solid block of billet aluminum, AP Custom Shotshell Carriers will stand up to the constant abuse of competitive environments. Shells are held in place with 303 Hi-Yield Stainless steel leaf springs for solid retention and smooth release. Each AP Custom Shell Carrier is drilled and tapped for a variety of popular belt attachment technologies, including MOLLE, Blade-Tech Tek-Lok and Safariland ELS.